BROWNSVILLE TN (June 5, 2018): Fife and Drum bands were once commonplace in West Tennessee, and now, thanks to a Tennessee Arts Commission apprenticeship program, a new generation is being exposed to the music. The public is invited to experience and learn more about the Fife and Drum tradition during FifeFest Saturday, June 16, 4-8 p.m. at the Delta Heritage Center in Brownsville TN. The event will feature Grammy-nominated bluesman RL Boyce and Brownsville’s own Kesha Burton. Fife and Drum Blues is an American folk music form generally performed with one lead fife player and a troop of drummers. The troop is very loosely structured and is often performed by families at reunions, community picnics and on holidays. 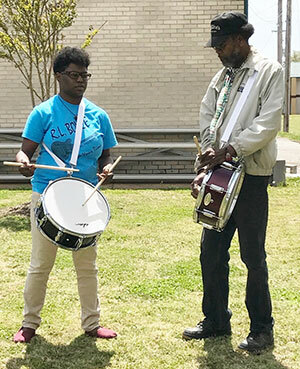 (Photo): Grammy-nominated Bluesman RL Boyce teaches student Kesha Burton the fife and drum traditions during a recent lesson at the Delta Heritage Center in Brownsville. Boyce and Burton are a part of the Tennessee Arts Commission Apprenticeship Program that pairs a master with a student in an effort to pass on knowledge of traditional art forms to a new generation. FifeFest is the culmination of a six month apprenticeship program that paired Boyce and Burton in an effort to teach a new generation the traditional fife and drum techniques. Already a skilled drummer, Burton quickly picked up on the drum portion of the tradition. Boyce then pulled in Hurt family fife player, Willie Hurt, to teach Burton to play the fife. The trio have been meeting twice monthly since December. • 4-5 pm – Learn what is being done to document and preserve the Fife and Drum history in West Tennessee through the research of John Shaw, musician and music scholar. For more information about the event, contact the Delta Heritage Center at 731-779-9000 or visit www.westtnheritage.com. Please bring your lawn chairs or blankets for the 6-8 p.m. outdoor performances.